For thirteen-year-old Sam it's not easy being the son of known civil rights activist Roland Childs. Especially when his older (and best friend), Stick, begins to drift away from him for no apparent reason. And then it happens: Sam finds something that changes everything forever. Sam has always had faith in his father, but when he finds literature about the Black Panthers under Stick's bed, he's not sure who to believe: his father or his best friend. Suddenly, nothing feels certain anymore. Sam wants to believe that his father is right: You can effect chnage without using violence. But as time goes on, Sam grows weary of standing by and watching as his friends and family suffer at the hands of racism in their own community. Sam beings to explore the Panthers with Stick, but soon he's involved in something far more serious -- and more dangerous -- than he could have ever predicted. Sam is faced with a difficult decision. Will he follow his father or his brother? His mind or his heart? The rock or the river? Kekla Magoon has worked with youth-serving nonprofit organizations in New York City and Chicago. 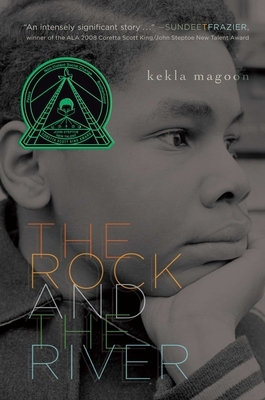 She holds an MFA in Writing for Children from the Vermont College of Fine Arts and her first novel, The Rock and the River, won the Coretta Scott King/John Steptoe Award for New Talent. She resides in New York City and you can visit her at KeklaMagoon.com.